Gayatri is the Adi Shakti, the life force, the eternal creative energy from which the entire Universe came into being. I created this short illustration (picture below) to shed some light on the deep esoteric significance of Ma Gayatri. In one form, Gayatri is depicted with 5 heads, 4 of them representing the 4 Vedas and the fifth head represents the Brahm Purush Himself. She has 10 hands, holding all the 10 symbols of Lord Vishnu. From Gayatri sprung all the Goddesses: Saraswati, Lakshmi, Kali etc. 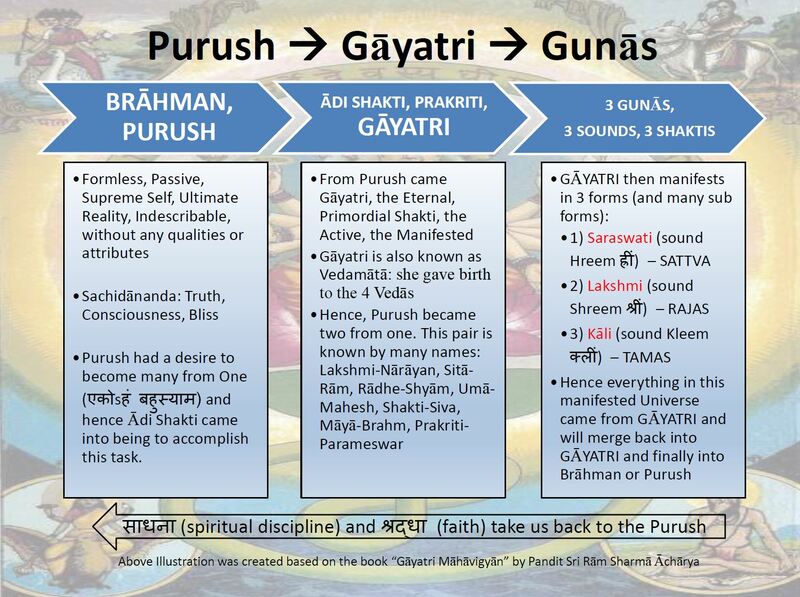 From Gayatri originated the 3 Gunas: Sattwa, Rajas and Tamas. Sattva is represented by Saraswati, Rajas by Lakshmi and Tamas by Kali. Rajas comes into being when Sattva and Tamas unite or come together. More on the significance and meaning of the 24 letters of Gayatri mantra in the next post. This entry was posted in Uncategorized on November 28, 2014 by illuminatelifetoday. Madhava Nidan is considered one of the finest texts of Ayurveda. It was written by sage Madhavacharya. Read below how Madhavacharya worshiped Gayatri and attained wisdom to write Madhava Nidan. 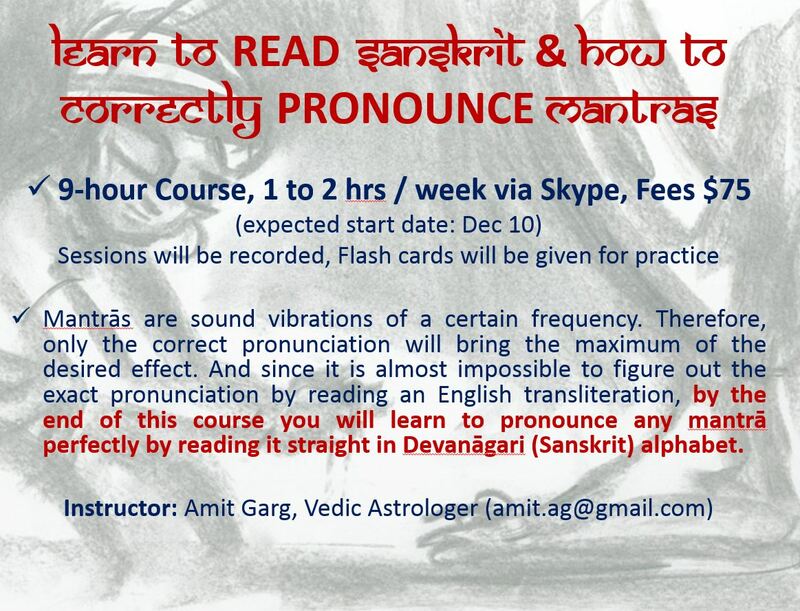 If you want to learn correct pronunciation, meaning and signification of Gayatri Mantra, I encourage you to join mini-course I will be teaching on Reading and Pronouncing Mantras. We will focus on Gayatri, Mahamrityunjaya and 9-planet mantras. See flyer below. More details here: https://www.facebook.com/events/1028635367162124. 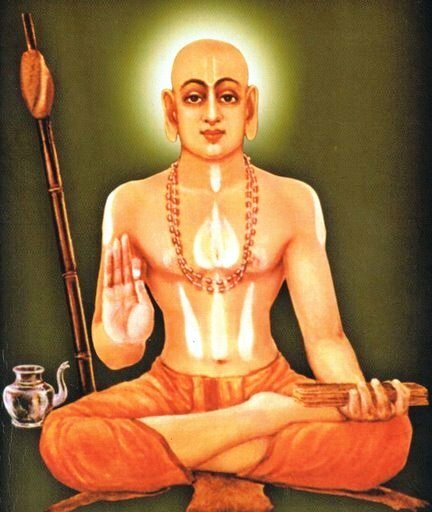 Madhavacharya was a saint living in Vrandavan. He performed the worship of Gayatri for twelve years but lost patience thereafter, as he did not get the desired divine benefits. He was quite distressed at that time. He left the sadhana of the Gayatri Mantra and began worshiping Bhairav on the advice of a tantrika. In less than a year’s time he succeeded in the sadhana of Bhairav. The celestial body of Bhairav appeared but stood behind him and asked him to demand what he wanted to be blessed with. Madhavacharya said; “If you are the real Bhairav, please appear before my eyes”. Bhairav said : “I can’t appear in front of you, because the brilliance of Gayatri- Shakti infused in you will burn me”. The devotee was surprised and inquired that if Gayatri sadhana was so powerful, why couldn’t he get the desired benefits for such a long time? Then Bhairav explained to him how his Gayatri sadhana up till then had destroyed his sins and burnt out the evils accumulated during his past lives and that it was only after this purification that he would have deserved realization and attainment of the divine boons of the mantra. Now there was no doubt left in Madhava’s mind. He restarted the sadhana of the Gayatri Mantra and was soon blessed with divine boons. With the awakening of inner intelligence and acumen, he wrote the “Madhav Nidan”, which remains till date, a crucial treatise for the education and expert practice of the Ayurvedic System of Medicine” – From Gayatri Mahavigyan by Pandit Sri Ram Sharma Acharya. This entry was posted in Uncategorized on November 22, 2014 by illuminatelifetoday. 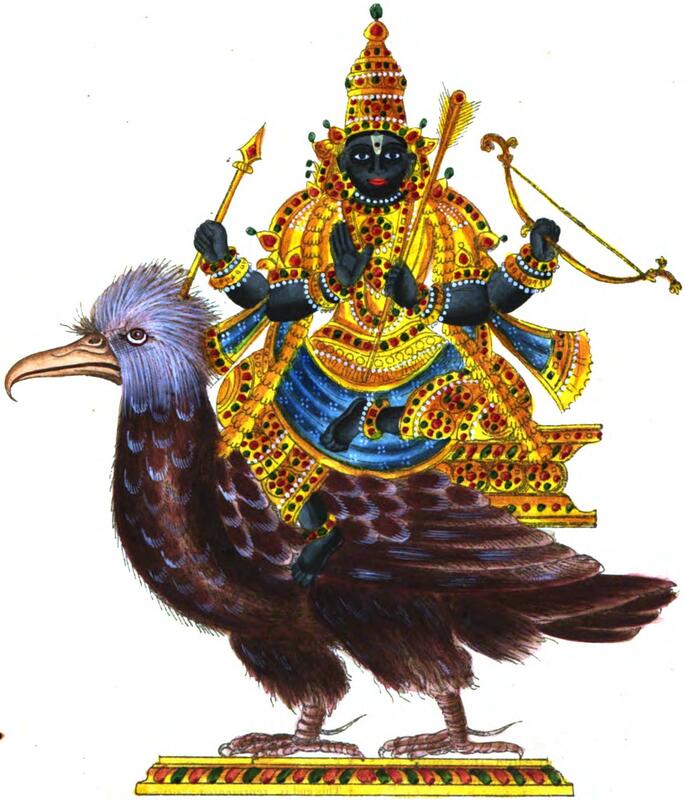 Shani, the planet of Karma is at 29 degrees and 55 minutes of Libra. In less than 24 hours, it will enter the sign of Scorpio and will remain there for the next 2.5 years. Shani gives us results of our karma slowly and thoroughly. It grinds our ego until even the last iota of it is left. In Scorpio, Shani will give this karma through change, transformation and hidden knowledge. What can you do? Surrender your EGO. Accept your karma. Shani will give you your deserved karma whether you like it or not. The sooner we accept it and surrender our ego, the easier it gets. Pain is inevitable but suffering is optional. All remedies are aimed at reducing the suffering. This entry was posted in Jyotish on November 1, 2014 by illuminatelifetoday.